Beverly Hills, CA — According to recent statistics from the American Society of Plastic Surgeons (ASPS), the total demand for cosmetic procedures has increased by five percent in the past year, with over 13.8 million performed in 2011. Dr. Jay Orringer, a board-certified plastic surgeon in Beverly Hills, says he has noticed a similar surge in the popularity of aesthetic treatments in his practice, particularly surgical procedures at this time of year. With more time for recovery, Dr. Orringer says patients often find this time before school begins to be a good period for body contouring, tummy tucks and breast procedures such as breast augmentation, breasts lifts, and breast reductions. 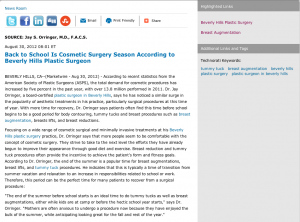 Similarly, Dr. Orringer says another popular procedure, prior to returning to school, is breast reduction. He says that students with uncomfortably large breasts may choose to undergo treatment before they go off to school. Regardless of which procedure patients are looking for, or when they decide is the right time for surgery, Dr. Orringer recommends consulting with a board-certified plastic surgeon before undergoing aesthetic surgery. He says taking the time to choose the right practice can better ensure that patients receive the safest, most effective care possible for their procedure. By partnering with an experienced and dedicated surgeon, Dr. Orringer says patients can enjoy the benefits of an enhanced appearance for the start of the school year. Dr. Jay Orringer completed his General Surgery residency at the University of Michigan Affiliated Hospitals and his Plastic Surgery residency at the University of California, Los Angeles Medical Center. He then completed a fellowship in Microsurgery at the New York University and Bellevue Hospitals. Dr. Orringer has taught plastic surgery for more than twenty years and is certified by the American Board of Surgery as well as the American Board of Plastic Surgery. He is a Fellow of the American College of Surgeons and a member of the American Society of Plastic Surgery and the American Society for Aesthetic Plastic Surgery. Dr. Orringer’s practice, The Renaissance Medical Center for Aesthetic Surgery, Inc. is located at 9675 Brighton Way, Penthouse, Beverly Hills, California. They can be contacted at 310-273-1663 and online via the website: drorringer.com.